Hocus Focus Productions - LumbervsJackAvailable NOW!DVDs and Posters available now on the bottom of this page! Autographed 8x10s Here! Keep checking the Facebookpage for the latestupdates on where tosee it and where to buycool LvJ stuff.Hashtag #LumbervsJackto tell us your scariest spookywoods stories and show usyour coolest tree photos. Follow @hocfocprod or the #lumbervsjack on twitter for more Lumber vs Jack news. Posters available now on the bottom of this page! When the forest around his property is genetically modified by an unscrupulous company, Jack finds himself surrounded by trees with ill intent. Lumber crews and hikers are disappearing. It's not long before he's forced to trek deeper into the forest in order to rescue his estranged wife from the creature at the center of it all. That is also the best way to "Support the Sequel"! The largest percentage of the money gets to go to the sequel of the movie, "Jack vs Lanterns"! Other Ways to Own Lumber vs Jack on DVD! You can buy the DVD direct from HFP using the link below. It's our best value. Would you like to set up a public screening in your home town to raise funds for a charity or cause? Contact us directly and we'll see if we can help. Especially appropriate for environmental causes. Don't worry the movie is in color, but this trailer is an homage to the old sci-fi movies that influenced Lumber vs Jack. Like the old trailers better? Check the video page for those and more! "Lumber vs Jack" is more than a sci-fi horror. It's a movie inspired by our times. With more and more of our plant life being genetically manipulated by big corporations for profit the dangers to people and life on the planet in general, is growing. Our story takes this battle of man vs man made nature and gives it substance. Using campy special F/X and some comedic moments to keep the mood light will make the story play like the satire it is. When Jack squares off against the terrible tree man and finally finds the center of the genetically modified forest, he and his band of eco warriors will come face to face with the monsters we all fight every time we go shopping for groceries. Sort of. ﻿Find out how to get the movie, meet members of the cast, maybe see a screening and more, on Facebook. Patrice Athanasidy﻿ - Make mine Mulch ! 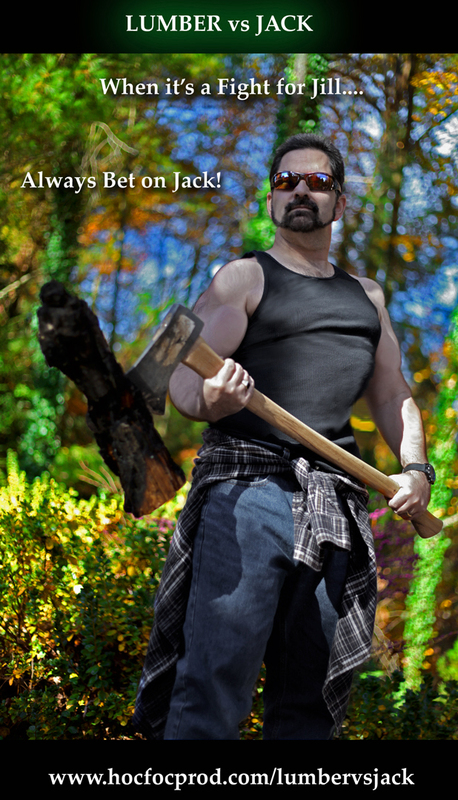 See promotional, production and exlusive behind the scenes content for "Lumber vs Jack" on the LvJ video page. First one is ten bucks, two for $15, three for $20. We can ship up to three in one tube/box. Free shipping in the U.S.A.
Foreign orders use our "Contact Us" page to ask about shipping. Orders online can be signed by the director, Jason Liquori for free. Just mention it on the form. THIS BUTTON IS FOR ORDERS WITHIN THE USA ONLY. ADDITIONAL CUSTOMS CHARGES APPLY TO ORDERS OUTSIDE THE USA AND ARE NOT COVERED BY THE SHIPPING CHARGES BELOW. DVD-Rs ordered from this page will be made "on demand". If you live outside the U.S.A. or would like to order multiple DVDs to one address please contact us about special shipping rates by using our ﻿Contact Us page. I CAN NO ISSUE FULL REFUNDS IF YOU USE THE BUTTON IN ERROR BECAUSE PAYPAL KEEPS A PORTION OF THE MONEY EVEN THOUGH I NEVER COLLECTED IT. PLEASE, DO NOT USE THIS BUTTON FOR ORDERS OUTSIDE OF THE USA. Follow us on﻿ Facebook for info on future screenings and upcoming promotions and show appearances.